↑ 1935 Nobel Prize in Physics. Nobelprize.org. Retrieved on 2012-08-16. ↑ 3.0 3.1 3.2 3.3 3.4 3.5 Mohr, P.J. ; Taylor, B.N. and Newell, D.B. (2014), "The 2014 CODATA Recommended Values of the Fundamental Physical Constants" (Web Version 7.0). The database was developed by J. Baker, M. Douma, and S. Kotochigova. (2014). National Institute of Standards and Technology, Gaithersburg, Maryland 20899. ↑ Chadwick, James (1932). 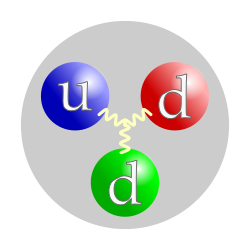 "Possible Existence of a Neutron". Nature 129 (3252): 312. Bibcode:1932Natur.129Q.312C. doi:10.1038/129312a0. ↑ Hahn, O. and Strassmann, F. (1939). "Über den Nachweis und das Verhalten der bei der Bestrahlung des Urans mittels Neutronen entstehenden Erdalkalimetalle ("On the detection and characteristics of the alkaline earth metals formed by irradiation of uranium with neutrons")". Naturwissenschaften 27 (1): 11–15. Bibcode:1939NW.....27...11H. doi:10.1007/BF01488241.. The authors were identified as being at the Kaiser-Wilhelm-Institut für Chemie, Berlin-Dahlem. Received 22 December 1938. ↑ Carson, M. J.; et al. (2004). "Neutron background in large-scale xenon detectors for dark matter searches". Astroparticle Physics 21 (6): 667–687. doi:10.1016/j.astropartphys.2004.05.001. ↑ G.A. Miller (2007). "Charge Densities of the Neutron and Proton". Physical Review Letters. 99: 112001. doi:10.1103/PhysRevLett.99.112001. หน้านี้แก้ไขล่าสุดเมื่อวันที่ 19 มกราคม 2561 เวลา 07:30 น.